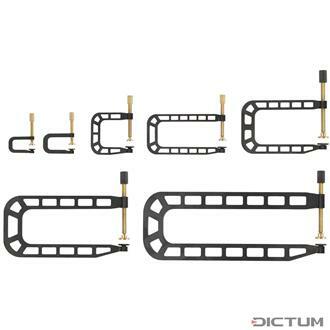 Herdim Repair Clamps, 7 piece set. These stiff and low weight clamps are ideal for the repair of fine instruments. The movable parts use the traditional movable brass plate and a precise brass spindle with knurled handle. The lower pad is adjustable in height and thus enhances the scope of application. Steel body with black anodized coating. Set includes 1 each of the Jaw Depth 26, 29, 40, 90, 85, 135, and 200mm.